How do you save money on diapers? Do you shop at wholesale clubs? Are you an Amazon Mom? If you are a coupon clicking mom who loves Luvs, I’ve got a way to save even more money! Yep, in this Sunday’s paper there will be a P&G insert that contains a high value coupon for up to $2 off any one Luvs Diaper Pack. This coupon can be redeemed at any mass, discount, or grocery store where Luvs Diapers are sold. In addition to this high value coupon, for a limited time only, you can use your smartphone to increase your savings. 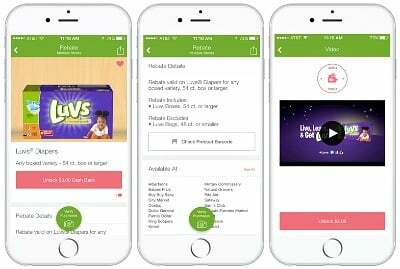 If you use the Ibotta app, you can earn a $3 cash back rebate with the purchase of any boxed variety of Luvs diapers, 54 ct. box or larger. Not sure how to use the Ibotta app? No problem. Here are the step by step directions on how to claim this offer. Verify your purchases by scanning product barcodes and submitting a photo of your receipt. That’s it! Your $3 cash back rebate will be deposited into your Ibotta account within 48 hours. Please note: This Ibotta offer is a limited time offer. Once you unlock the rebate, you can see the exact date of the rebate expiration. In order to qualify for the rebate, you must submit your receipt before the rebate expiration. 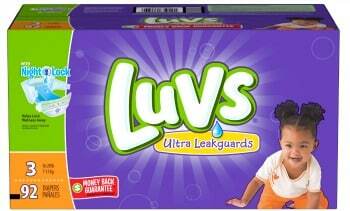 If you have little ones in diapers and have not used Luvs, you are missing out. Luvs Diapers feature large refastenable stretch tabs that make fastening super easy for Mom and give baby a snug fit again and again. They also have Leak Barrier Leg Gathers and a Leakguard Core which helps keep leaks in the diaper (where they belong), so baby stays dry and comfortable. With Luvs Diapers secure fit and their superior leak protection, it is no wonder why Luvs is the official diaper of experienced parents. Luvs is so confident you will be pleased with their diapers, they offer the Luvs Money Back Guarantee. That’s right, if you aren’t satisfied with the leakage protection of Luvs, they will refund your money. See their website for details. www.luvsdiapers.com. So what are you waiting for? If you are a diaper shopping mom, you won’t want to miss this offer. Want another way to put more money in your pocket? How about winning a $100 American Express gift card? Simply enter via the giveaway form below. Giveaway ends Monday, June 6, 2016. Good luck!